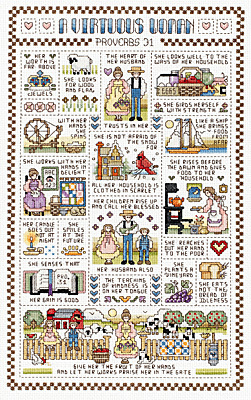 Another beautiful Janlynn design is showcased in this Counted Cross Stitch kit. The sampler, A Virtuous Woman, highlights the sentiments of Proverbs 31. This inspirational design from Deborah Lambein would be a great accent to any room. Kit includes: 14-count White cotton Aida, 100% cotton 6 strand carded floss, needle, graph and multi-lingual instructions. Design size: 9.25” x 15.25”. Made in the USA.